Is your sales career green and growing or ripe and rotting? 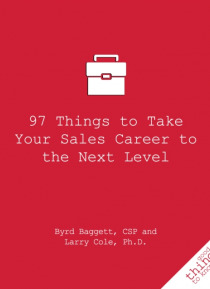 Whatever condition you find it in,97 Things to Take Your Sales Career to the Next Levelshares simple but practical insights to help you become a high-performing sales professional. Unlike other business guides, this handbook features easy-to-understand strategies you can begin practicing in just minutes for high payoffs.